Apple piled on to its list of announcements on Tuesday with updates to Clips and GarageBand for iOS, adding a barrage of content to both, and a new feature to the second — support for the iPhone X's TrueDepth camera. The Clips 2.0.3 update has four new Live Title styles, along with four more animated labels, nine more animated stickers, and 11 posters for animated title cards — among them blackboard and notebook designs, reflecting today's education event in Chicago. Exclusive to the iPhone X are two extra Selfie Scenes based on Pixar movies: the reef from "Finding Dory," and the Scare Floor from "Monsters, Inc."
Smaller changes include drop shadows to make some labels more legible, and bugfixes for problems like iCloud Photo Library material failing to display properly. 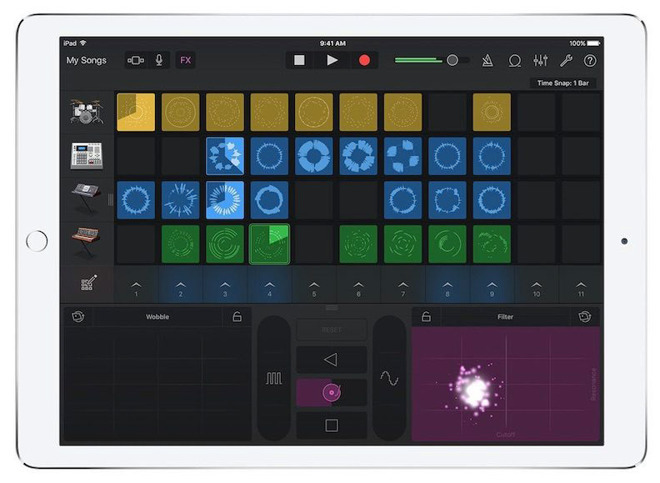 In GarageBand, the TrueDepth camera can be used to control effects like wah and synth parameters through facial expressions. The app now also has a "Modern Wah" guitar stompbox, and a downloadable "Toy Box" sound pack with education-themed effects such as counting to 10 in multiple languages. Both apps are free downloads, and run on devices with iOS 11 or later.